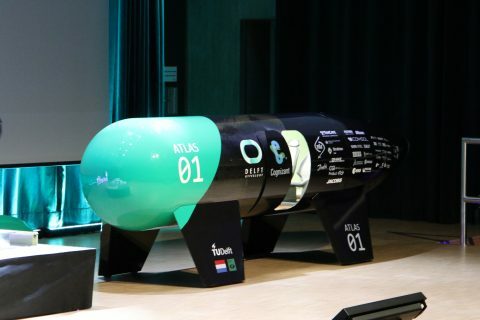 Delft University of Technology Hyperloop Team II has revealed their new Atlas 01 Hyperloop pod and launcher on Tuesday. The reveal took place on campus in Delft, the Netherlands. The team focused on creating a pod that could reach high speeds in a short period of time, because the students will take part in the third part of the SpaceX Hyperloop Pod Competition in California, in July of this year. The Hyperloop is a state-of-the-art mode of transportation. A pod, fit for passengers or cargo, travels through a sealed tube. The capsule floats. Because of the lack of air resistance or friction, the vehicle can reach very high speeds. In theory, it must be possible to reach 1200 kilometres an hour on a fully completed Hyperloop. 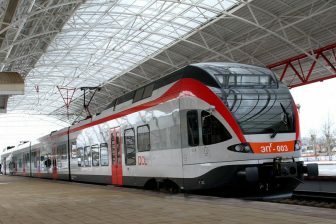 In comparison, this means the vehicle would only take 30 minutes to travel from Amsterdam to Paris. The students started designing and building the capsule at the beginning of the school year, in September 2017. Last year the team won the first part of the SpaceX Hyperloop Pod Competition 2017. The pods that enter this competition are scaled-down versions of what a real pod would look like. This part focused on safety, amongst other factors. But the Delft team was defeated in the second part of the competition, in which the teams were tested on speed. Students from the German University of Munich beat the Dutch team. This year, however, Elon Musk has organized a different competition. Chief Engineer Vlad Petrescu said: “Last year was very amazing, because the team won, but now the rules have changed. There is a new competition. The goal is to reach the topspeed.” The test track is only one kilometres in length. The current world record is 384 kilometres an hour. The team is hoping to beat this record. Technical Manager Maurits Houck illustrates just how tough it is to reach high speeds in such a short period of time with a video of the fastest car in the world. “It takes this car 2,5 minutes to get to its topspeed and back to zero. We’re trying to get this done in only 15 seconds. This shows how crazy it is, what we’re trying to do as students. Basically it is a horizontal rocket launch.” Petrescu: “And we have to do it in one year.” On top of all of these challenges, the team only has one shot to prove itself on the 22nd of July in California. Every single part of the scaled-down pod has been designed with a single purpose in mind: to reach as high a speed as possible. One of the problems of reaching high velocities, is acceleration. “Sometimes, while accelerating, tires can slip. For that reason, we designed a clamping system. It will put pressure on the wheels, so that they can get enough grip to accelerate,” Houck explains. To accelerate, a strong power source is necessary. One that is not only capable of storing enough energy, but can also create a high enough output to reach high speeds in a very short amount of time. The battery consists of 768 small lithium polymer cells. Again: painstakingly assembled by students of the team. The vision of the Hyperloop Team goes beyond building the pod. TU Delft launched the website Hyperloop Connected just last month. This is an international platform to share information about technological advancements to make the Hyperloop a reality. 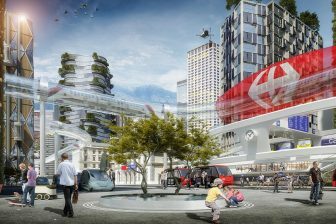 It also created concept-art for a hyperloop station. 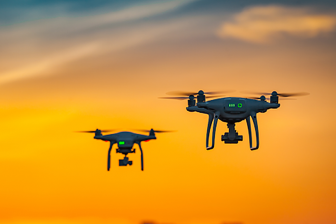 Next year, TU Delft is going to provide a massive free online course on the technology. Entrepreneur Elon Musk first mentioned the Hyperloop in 2012. With his company SpaceX, he organises Hyperloop competitions for student teams around the world every year since 2015, intended to keep the development of the Hyperloop moving at a high pace. The TU Delft Hyperloop Team II consists of 37 master students who are top of their class. The programme encompasses a full school year. The SpaceX Hyperloop Pod Competition will take place on the 22nd of July in Hawthorne, California.